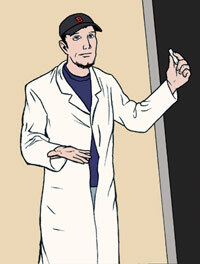 PhD Unknown is a weekly webcomic about science, life, and the unknown. With monsters. Dante Shepherd is the creator of the daily photocomic, Surviving The World. When he's not writing or chasing a baby, he can be found in his spare time using his chemical engineering PhD to teach thermodynamics. Joan Cooke was born in Annapolis, MD and started drawing cartoons there as soon as she was able to pick up a crayon. Through school, she constantly filled up the margins of notebooks with characters. She studied and received a Bachelor of Fine Arts for Sequential Art from SCAD in 2012. Currently, she spends her time drawing monsters, pretty ladies, and skeletons.